The '67 Heaven Hawk is inspiring to look at and play, and from Danelectro, we wouldn't expect anything less. Sharp Dano Masonite tones. Lipstick pickups. Very playable neck. Binding peeling. Alligator looks may deter. 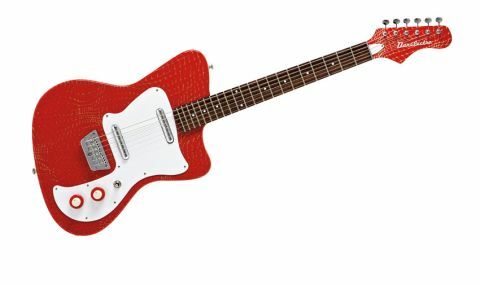 There's a long history of wacky designs in the Danelectro catalogue, but the Hawk surely ranks as one of the best. First unveiled in 1967, its funky offset body and short scale length made it an intriguing proposition for the student market, and the '67 Heaven Hawk reissue hopes to recreate that playability and retro-cool looks for a new generation, courtesy of a few performance upgrades and a slightly bonkers new finish. "The '67 Heaven Hawk's lipstick pickups have a hotter output than their 60s predecessors"
The most important sonic enhancement comes via the '67 Heaven Hawk's lipstick pickups, which have a hotter output than their 60s predecessors. Elsewhere, the original's 18 frets have been replaced by a more electric-friendly 21, while a modern six-saddle intonatable bridge occupies the place where the old- style metal tailpiece would have been. Returning are the original's fiddly dual concentric volume and tone controls, and the surprisingly conventional headstock. Unlike most other guitars, the Hawk's semi-solid body isn't made from solid woods or laminates but is instead a wooden frame topped, front and back, with Masonite (aka hardboard). Not only does this make the Hawk easy on the back, but it combines with the Les Paul-like 629mm (24.75-inch) scale and those lipstick pickups for a glassy, resonant tone you can't get from solid guitars. While it was originally done to cut costs, the Masonite build has become an iconic feature of the Dano brand. We still haven't mentioned the finish: it's called Alligator. In this case, it's Red Alligator, but you can also pick it up in Orange, Blue and Creme Alligator, or just Black (£50 cheaper). The Alligator finish has a 3D-ish textured effect that you can actually feel as you run your fingers over the body, and it's topped off by vinyl binding - this was already starting to peel away on our review model, though. "Playing it is a seriously refreshing experience"
The '67 Heaven Hawk might look cartoonish, but actually playing it is a seriously refreshing experience, especially if you've never picked up a Dano before. Those hot lipstick pups give off fat, compressed single-coil tones that verge on a P-90 level of output, while switching to the middle position runs both at once in series, which gives a pseudo humbucker sound. The pickups' hotter output means they don't fall apart with heavy overdrive and distortion, either - they resonate, verging on the edge of musical feedback. Combine these tones with the eminently playable neck - which feels less cramped than a Les Paul's, not as elongated as a Strat's - and you have a guitar that suits a range of genres, from garage- rock to dirty blues. It does have plenty of idiosyncrasies, though, and if any other manufacturer put this out maybe we wouldn't be so accepting. But the '67 Heaven Hawk is inspiring to look at and play, and from Danelectro, we wouldn't expect anything less.